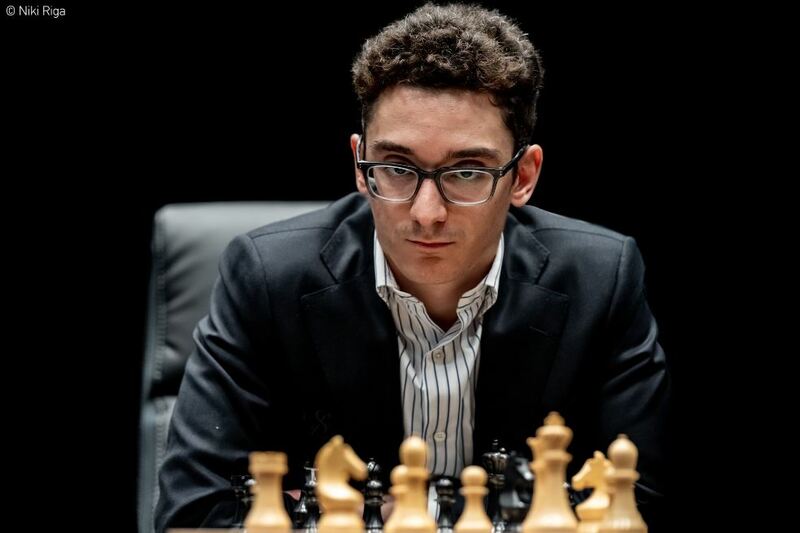 Fabiano Caruana outplayed Magnus Carlsen from a seemingly dead position in Game 6 to come within a whisker of scoring the first full point of the match. Computers, and some chess fans, were screaming mate-in-36 for the US challenger, but the endgame win was one Peter Svidler didn’t think it was “humanly possible to find” in the time available. 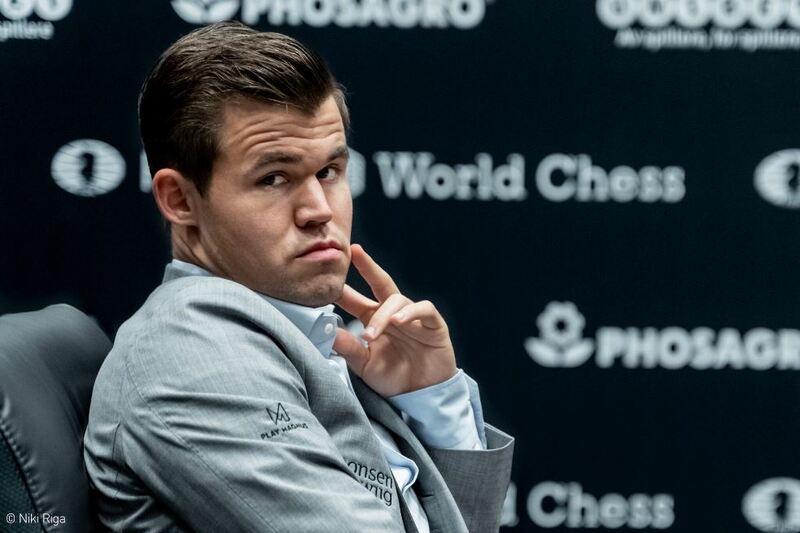 Instead the 80-move, 6.5-hour draw could be chalked up as brilliant defence from the World Champion, who confessed to having been “way too casual” earlier in the game. The match is level at 3:3 at the halfway point. 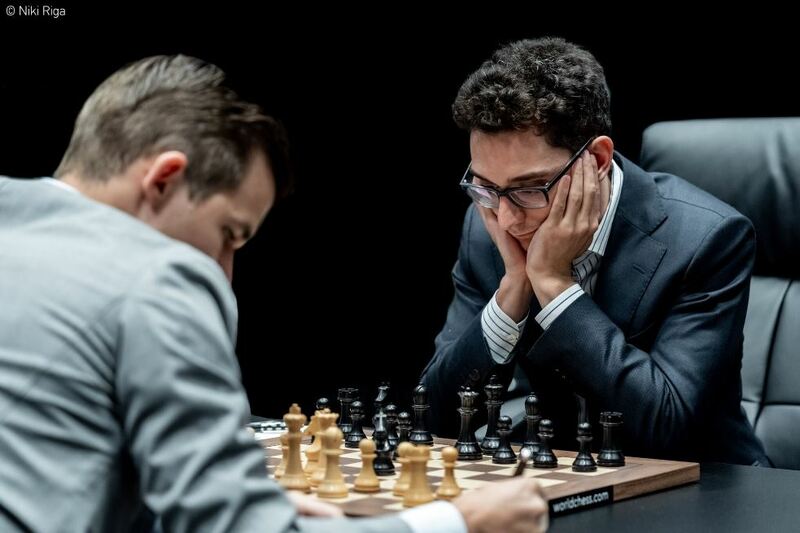 If there was one opening we anticipated seeing in the match it was the Petroff, a defence that Fabiano Caruana has returned to the feared position it had in chess before the Berlin took over as Black’s drawing weapon of choice. In Fabiano’s hands it hasn’t only been about draws, since this year he’s used it to beat Vladimir Kramnik and Alexander Grischuk in the Candidates Tournament, Nikita Vitiugov in the GRENKE Chess Classic, Ray Robson in the US Championship and Vishy Anand in Norway Chess, to give just the classical victories. 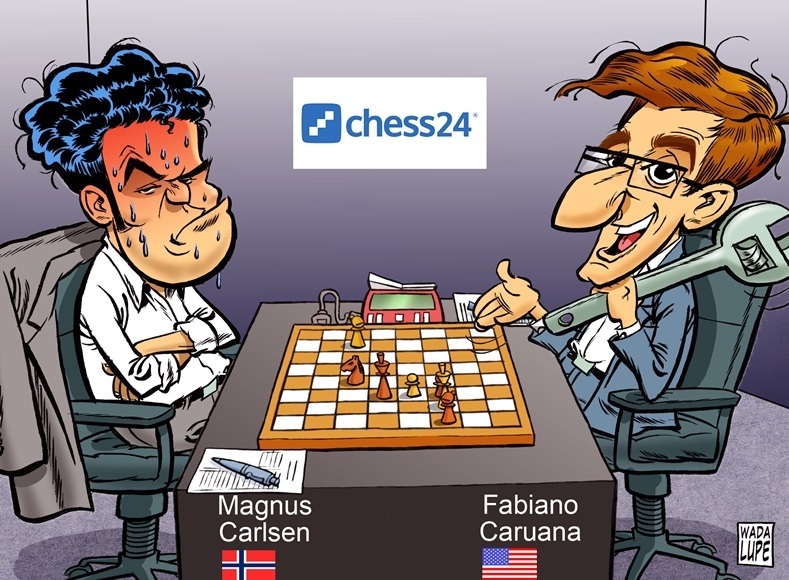 We hadn’t seen it in London yet, since Magnus hadn’t opened 1.e4 in his first two games, and we were also wondering if the videogate affair would mean Fabiano was wary of entering lines where some of his preparation might have been “burnt”. In the end, though, those fears proved unfounded, and Fabi stayed true to his play over the last year, responding to 1.e4 e5 2.Nf3 with 2…Nf6. The next sequence, 3.Nxe5 d6 4.Nd3 Nxe4 5.Qe2 Qe7, had been seen in So-Caruana in the final round of this year’s Sinquefield Cup. Magnus here opted not for Wesley’s 6.Nc3 but 6.Nf4, that had given Alexander Motylev victory over Evgeny Miroshnichenko just 11 days earlier in the Winter Chess Classic in St. Louis. Evgeny played 6…Nf6, but Fabiano knew the antidote 6…Nc6! 7.Nd5 Nd4! Svidler called this “one of the most peculiar openings I’ve seen in a while!” and with 10…Ne6! next we’d had 15 knight moves, including 10 in a row, by move 10! It’s very funny looking, but unfortunately it leads to a very dull position – so the excitement is only for one move or so. He was ready to go on strike - “Honestly, I don't want to analyse or even discuss this position, until something happens” - but his description of the game was still priceless! Kramnik, when he was still living in France and not Switzerland, told me a great story that in France they're going to have a reality show. Basically they will put some cameras in the coffin. And it will be like ok, there's a dead body in the coffin! There will be some probably lights and cameras, several cameras, and it will be like twice per day some 15 minutes on TV with highlights and just 24/7 on the internet. It's about as exciting as this game! Full credit to the players and I think Fabiano in particular for finding the idea of playing c5 in this position, turning the game quite sharply around and creating a street fight where really none seemed available to either of them. I think from move about 22 to the time control I made many mistakes. c5 was an attempt to break out, otherwise Black is very slightly worse, and then I just got way too casual with this whole Bc2 and Rd1 thing. I was just thinking in terms of the positional concept that I’m going to put my bishop on b3, as we are taught with a double isolani, but then I wasn’t even close to being in time with that, and I felt already just a few moves later I was fighting for equality. For the next 10 moves Fabiano played with computer-like precision, while Magnus missed chances to bail out (e.g. 29.Bc7! 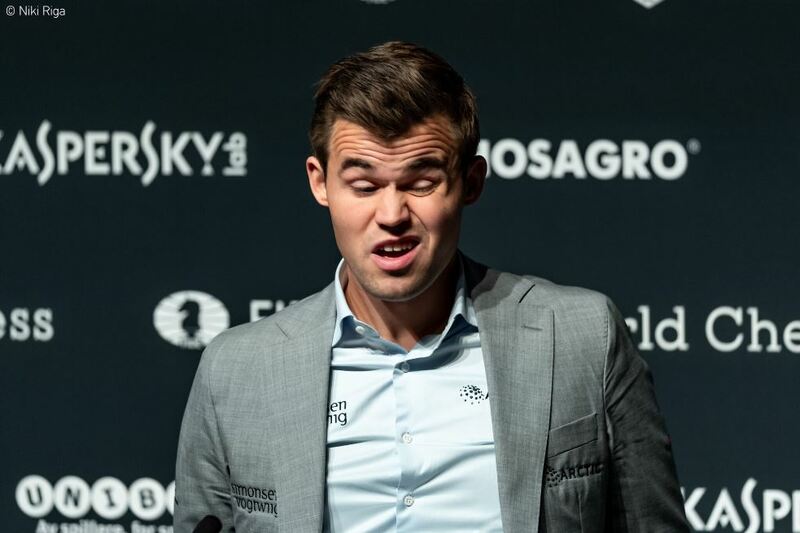 and, “I’m very slightly worse, but I should hold that any day of the week” – Carlsen) and was even getting into mild time trouble as the time control approached… though one of our team members struggled to take that seriously! I thought at least this Bc5 will give him a very tough decision, whether to play something like Nc2, and my d-pawn becomes dangerous, or go for this position. 43.Nc2 is probably just losing after 43…d4, and by this stage Magnus felt he had no “decent alternatives”, so he went for a piece sacrifice with 43.Bf3!? Nd2 44.Bxd5 Bxe3 45.Bxc6 Bxf4 46.Bxb7 Bd6 47.Bxa6 Ne4 48.g4 only to realise that he’d missed 48…Ba3! As a matter of fact that was the second time in the game I’d missed the plan with Ba3. I thought I’d actually have three pawns, not two pawns, so I thought it would be a fairly straightforward draw, and then when it turned out I only had two pawns I was quite worried. And then full credit to Magnus for seeing the correct setup - in particular, I think, finding courage on move 58 to go a5, giving up your outside passer to go for this setup. It requires a very deep understanding and also very deep belief in your assessments. I'm pretty sure his evaluation was correct, and the fact that he later misplayed this position is just a testament to how tricky this position actually is. I think when I get Kh7 and h5 it’s an iron-clad fortress, more or less, unless I’m just hallucinating, but I thought it’s a fortress. Not bad for a man who two years ago in New York had famously said he doesn’t believe in them! Even when I saw what the machine suggested was winning there I honestly don't think it was humanly possible to find it on the 10 minutes that Fabi had, and it's incredibly weird how the position is conceptually lost after Kg6. Such assessments can be utterly inhuman, like this one, but they’re mesmerising and hard to resist! To play 68…Bh4!! you should have seen, as chess legend Garry Kasparov also pointed out, that after 69.Bd5! Ne2 70.Bf3 the only winning idea is 70…Ng1!! At the end it still seems a bit accidental. To find this you have to basically be thinking very hard about each move, to find some accidental chance, and at some point I had pretty much given up near the end - I thought it was a fortress. In the game after 68…Nf3 you could perhaps direct some criticism at Fabiano for failing to make Magnus suffer a little more, but the 6.5-hour 80-move draw that followed was a fair result for an epic contest. I think the thing is that maybe it’s easier to be a bit careless with White, as you always feel like you have more room for error. Today I guess I was a bit influenced by the fact that I had the white pieces – with Black I probably would have played more carefully in the early middlegame. It’s going to be an intriguing battle whatever happens, and once again Peter Svidler, Alexander Grischuk and Sopiko Guramishvili will be at your service to commentate on the whole game. Sopiko will also be in action this Saturday, as she plays Banter Blitz from 14:00 CEST. Don’t miss it!